This evening at our church following a “partnering with parents” meeting to discuss changes to our youth ministries programs and classes, I had a conversation with another dad interested in using his new MacBook laptop in lessons he teaches on Sunday mornings. He has never connected it to a TV or projector, so I showed him Apple’s mini-displayport VGA adapter on Safari on my iPad, since we had Internet connectivity available in the room where we were meeting. We also discussed the need to convert the digital signal of his computer to an analog signal the older TVs at our church can display. 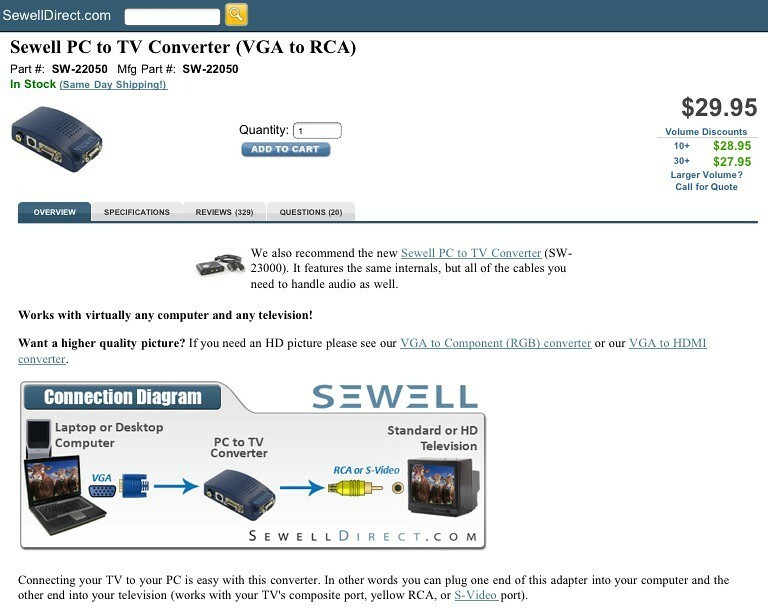 I recommended the following $30 Sewell PC to TV converter, which I learned about a few weeks ago and tweeted. 1. It is valuable to document our learning on Twitter, on social bookmarks, on blogs and elsewhere because these “digital footprints” can serve as digital bread crumbs we can follow later (along with others) to relocate / rediscover (or encounter for the first time) ideas as well as links to solve problems and answer questions. 2. We shouldn’t make assumptions about the knowledge of others when it comes to technology and media, and we need to remember the importance of sharing the basics. If we want to “talk with media” effectively and encourage other educators to do the same, one starting point is connecting our digital devices to external displays. In some schools those connections are provided for teachers by technical support staff, but there are many contexts (like our church) where that kind of professional help isn’t available. This experience tonight got me thinking about the possibility of offering a short class for other teachers at our church on basics like laptop connections to TVs as well as projectors, and other simple but important skills like saving offline copies of YouTube videos onto a laptop or USB / flash drive. What other “lessons learned” do you think are illustrated by this conversation tonight about connecting a laptop to a TV? Thanks once again for another post about technology. I like how you don’t only show or give suggestions on how to use technology but you go a step further and show people how to use technology to its fullest potential. I am a student of Dr. Strange’s EDM310 class at the University of South Alabama. Thanks again for your post.